Singapore Regional Foreign Policy: No Friends, No Credit. No friends. This statement comes from Malaysian opposition (DAP) member of parliament Tony Pua. Our regional foreign policy results to a “No Friends, No Credit” situation and we are still quite proud of continuing doing that. Still remember what Lim Swee Say said during GE2015, “luckily, we are not Malaysians (as well not mainland Chinese)." This, perhaps, shows how naive and ignorance the PAP politicians and their advisers are. If we look at what (then) Foreign Affairs Minister K Shanmugam said in Singapore Press Club#4 about education in Malaysia, you can guess the thinking level of Singapore official understanding of Malaysian politics. No wonder an activist misunderstood him. He seems not understanding the real reasons why pragmatic Malaysian Chinese parents (like Singaporeans) want to send their children to the better ‘quality’ Chinese independent schools. He may also not understand why the Malaysian government now grants licence to three privately run Chinese universities. The problem is our regional foreign policy. We don’t know the proper channel of approaching our neighbours. It is clear now the Indonesian side is looking for a multinational task force to tackle the haze problem. They want helps beyond Singapore and Malaysia (so that Singapore cannot claim credit?). Do we really know why we have no friend and no credit in the region? And yet we receive very high international reputation outside the region. [And if they know about current events, it is often about global rather than regional affairs. Those who are better off know London and Sydney well, but have never visited Yangon or Phnom Penh. Singapore ends up with no friends, no credit in the region. Can we just simply blame others for creating instability and problems and refuse to understand them? The future of Singapore will be quite different from the past. It is a question of sustainability and crisis management. In Chinese, we say creation is easy but sustainability is difficult. 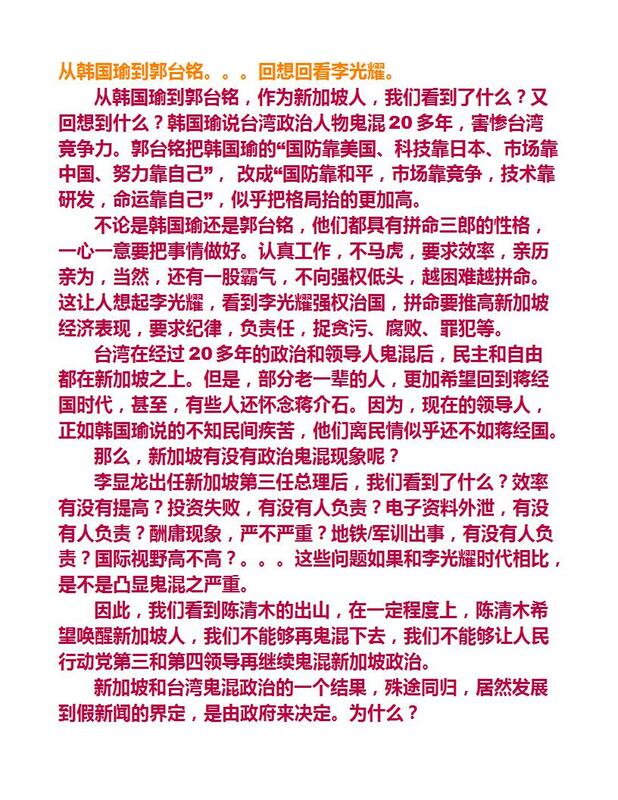 (创业容易守业难). If SG50 is a creation then the future is an sustainability. Why is sustainability difficult? It involves more uncertainties, more crisis management without successful past references and models, and for Singapore case, without checks and balances, transparency and openness. Chinese dynasties in the past proved that sustainability was a difficult question than creation. All dynasties failed because of lack of checks and balances. In between, some dynasties had short periods of re-born, re-creation or resurgence (中兴）where there were economic growth and propsperity. However, resurgence could only prolong the life of dynasties. Is the new “The Future Economy” panel a resurgence? Is the recent 70% mandate a sign of PAP resurgence? If yes, it may last a short period as shown in Chinese history. The new cabinet does not have the spirit of checks and balances. It only wants to check itself. What is the difference between “the future economy”/new Singapore chapter and the old SG50? Just like PM Lee’s calling, it is normal and healthy as defined by the People’s Action Party government. 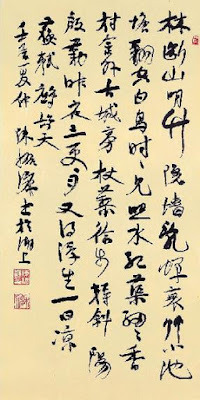 It is a continuation of the old practice, old tradition. Just look at the haze crisis. It is an age-old problem and we are unable to solve it for many years because the source problem is not in Singapore. During the Suharto era, it seemed to have few problems or problems could be solved between past Indonesian and Singaporean governments. We are in the post-Suharto, post-LKY or even post-Mahathir eras, can Singapore continue to use the same old practice and tradition to deal with regional problems? We seem at lost in dealing with the haze crisis and our (immediate past) foreign minister dared only made comments in his Facebook. This example shows we are good at dealing with certain type of foreign politicians but when the situations change, especially, demand for transparency and checks and balances in foreign countries, we do not know how to handle the situations. Minister Heng’s future economy and PM Lee’s new Singapore chapter will have problems finding a suitable path if they only think of a control situation. 70% domestic support does not mean 70% support outside Singapore. The assumption of same support level will lead to a downfall of PAP dynasty. Heng and Lee are trying to find a quick solution as they have pressure under a strong mandate. It is just a resurgence for the PAP. But any future directions and proposals without checks and balances, even with SG conversation, will not bring long-term sustainability to Singapore.